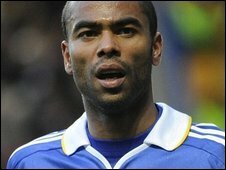 Chelsea and England footballer Ashley Cole has been arrested on suspicion of being drunk and disorderly. 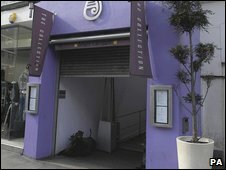 Mr Cole was held after swearing at police officers outside west London's The Collection bar and restaurant, BBC crime reporter Ben Ando said. Police said a 28-year-old man was held in Brompton Road, South Kensington, at about 0215 GMT. He was taken to a police station and given an £80 fixed penalty notice and released at about 0530 GMT on Thursday. No further action will be taken, a Metropolitan Police spokesman said. Our correspondent said: "Mr Cole was held after swearing repeatedly at police and refusing to calm down after emerging from The Collection in South Kensington at around 2am." The premises are about 1.3 miles (2km) from Chelsea's Stamford Bridge stadium. Manager Burim Maraj said Mr Cole had been out drinking with Chelsea and England captain John Terry and other Chelsea team-mates. He said the footballer was "rude" to police after getting frustrated by waiting paparazzi. A spokesman for Chelsea FC said: "We are aware that Ashley was detained last night. We will want to establish all the facts before commenting." Prior to his arrest, Mr Cole had joined Chelsea's first team squad and more than 300 charity workers, celebrities and supporters at a fundraising event for two children's charities. His wife Cheryl, singer with Girls Aloud, is currently climbing Mount Kilimanjaro in Africa for Comic Relief.